Reduce pollution. Fewer cars will lead to less pollution. Make city centres more attractive for pedestrians and cyclists, which will help increase the quality of life. Raise revenue. The money from congestion charge can be spent on other forms of public transport and increasing alternatives to driving. Reduce Journey Time. This is good for business, but also helpful for emergency services in getting to serious injuries quicker. Lost Business for firms in the city centre. It is argued that a congestion charge will encourage people to visit out of town shopping centres and lead to a decline in city centres. Expensive to Administer. The costs of collecting a congestion charge are much higher than petrol tax. It requires sophisticated technology and chasing up drivers who don’t pay or try to avoid. For smaller cities, the administration costs may be prohibitive. Inequality. A congestion charge is regressive as it takes a higher % of income in tax from the poor. The congestion charge has reduced some of London’s worst traffic problems. People don’t like paying taxes, but neither do people like sitting in a traffic jam. It annoys me how many voters expect solutions to problems without any tax. It was feared that a congestion charge would lead to more congestion in the area surrounding the congestion zone, however, this hasn’t materialised. Other reports are more sceptical of the reduction in traffic volumes. However, London has seen a prolonged growth in traffic volumes. A congestion charge may just reduce the growth of traffic volumes. How Effective Will a Congestion Charge Be in Reducing Demand? If the tax is quite significant, such as £7 per journey, you would expect it to have the effect of reducing demand. However, it is uncertain how much demand will fall by. If demand for driving in this area is inelastic, the higher price will only have a relatively small effect on reducing demand. However, if demand is elastic then there will be a bigger % reduction in demand. 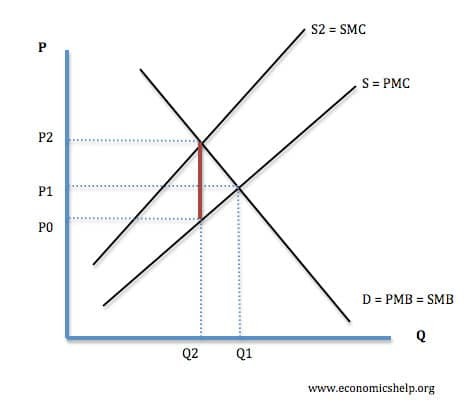 There are various factors which will determine the elasticity of demand. How necessary is it for people to drive in that area? For example, is there good parking on the outskirt of the area? If the main shopping centre is in the zone, people may still need to drive there. Over time. Over time the congestion charge may become more effective. i.e. people have time to buy a bike. In the longer term, shops and businesses may relocate outside the congestion charge. The charge raises the money required to provide the infrastructure. Could you please tell me what software you used to draw the graph? Could you send me a more detailed report about effectiveness of London Congestion Charge? My teacher Mr Turner is not making us do a geography case study and as such we have been advised to use this webpage. I thank you for providing the necessary information to fill out the worksheets he has so kindly provided us with!